Based on the latest U.S. Census Bureau data, Chester County grew by over 20,000 residents from 2010 to 2017, an increase of 4 percent. In terms of numerical population increases, Chester County ranked fourth in the state, behind Philadelphia, Montgomery and Lancaster counties. Clearly the population growth is concentrating in the southeastern part of the state. 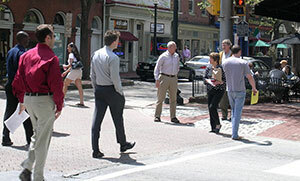 In terms of the population percent increases, Chester County ranked sixth. Two Chester County municipalities were among the top 20 statewide in terms of largest numerical increases: East Brandywine and West Chester, which ranks first among all boroughs statewide. Within Chester County, the municipality with the highest total numerical increase was East Brandywine, which grew by over 1,700 people (a 25.7 percent increase from 2010). This township has undergone many years’ worth of development along the Route 322 corridor. The five municipalities that increased by 1,000 persons or more were West Chester, West Goshen, London Grove, East Whiteland, and East Brandywine. A total of 44 Chester County municipalities underwent a gain or loss of fewer than 200 people from 2010 to 2017, which indicates that over half of the county’s municipalities have remained relatively stable so far this decade when it comes to numerical population growth. Read more about the latest Census data here.